The Landsat Data Continuity Mission (LDCM) arrived in its final orbit last month, putting us all one step closer to getting our hands on some of that gorgeous new data. As NASA continues to report progress toward the handoff of LDCM to the USGS (at which point the mission will be renamed Landsat 8), the USGS continues to advertise that data from the new sensors will be available to all users by the end of this month. Already, several sample datasets acquired by the LDCM’s Operational Land Imager (OLI) and Thermal Infrared Sensor (TIRS) are available from the USGS. 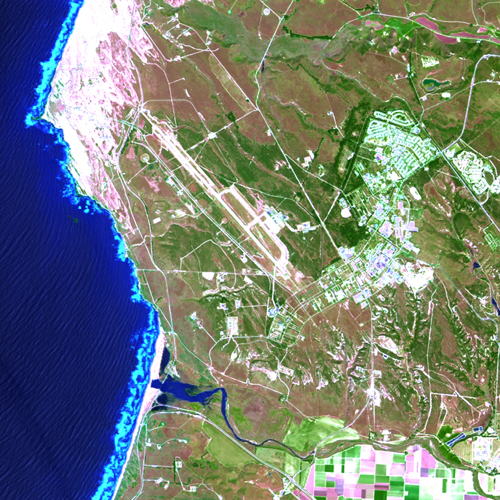 Pan sharpened false color (bands 6, 5, 3) image of Vandenberg Air Force Base, CA collected by the OLI sensor aboard LDCM. Image courtesy of U.S. Geological Survey. In preparation for Landsat 8 data becoming generally available, we will be including full support for Landsat 8 data in the upcoming Service Pack 3 for ENVI 5.0. Service Pack 3 will also add support for NPP VIIRS data, DubaiSat-1 data, EO-1 data, Pléiades-HR 1B data as well as other improvements. Prior to the release of Service Pack 3, those with ENVI 5.0 licenses will be able to download the Landsat 8 support as a patch to ENVI 5.0 Service Pack 2 by logging into exelisvis.com. We are also pleased to highlight Landsat 8 during the upcoming VISualize 2013 conference for ENVI and IDL users, June 10-13 at the World Wildlife Conference Center in Washington, D.C. The keynote speaker at this event will be Dr. James Irons, LDCM Project Scientist at the NASA-Goddard Space Flight Center. The third day of the event will consist of a seminar on the new and improved capabilities of Landsat 8. What are you hoping to do with Landsat 8 data?